Apple Chief Executive Tim Cook is still upbeat on the his company's outlook in the world's most populous nation, saying that he isn't discouraged by this past quarter's somewhat disappointing numbers in China. Apple did $4.64 billion in revenue in China in the recently completed quarter, down 43 percent sequentially and 14 percent year-over-year according to Apple's quarterly data sheet. This coming directly after what Cook called "our best China quarter ever." Cook says investors shouldn't be concerned about the company's fortunes in that market, which recently passed the United States as the largest market for mobile devices. "China was weaker in the quarter," Cook said during the iPhone maker's quarterly conference call. "The data sheet focuses on revenue, and it doesn't tell the complete story. If you look at sell-through, the sell-through in China was only down four percent from the year-ago quarter when normalized for channel inventory." "Mainland China was up five percent year over year," Cook continued. "That's a lower growth rate than we've been seeing, and I attribute that to many things." Cook made reference to economic troubles in China, which has seen its typically blazing growth rate hobbled by market forces, as well as the impact of a still soft global economy. "The economy there clearly doesn't help us and others," the Apple CEO said. Cook pointed to positive indicators in the world's most populous country as a sign that the just-finished quarter should not be taken as an ill omen. 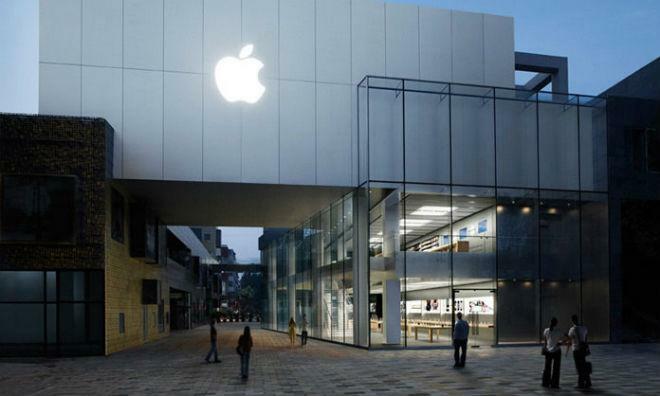 Apple's revenues in greater China represented about 14 percent of the company's revenue for the quarter. Over the last 12 months, the company has done $27 billion in revenue. Additionally, iPad sell-throughs in greater china were up eight percent. In mainland China, Cook said, sell-throughs were up 37 percent. Apple's bestselling tablet also occupies a prime spot in China, with a higher than 50 percent share according to Cook. Those sell-through figures are likely due to Apple's greatly increased efforts to market its products in China. Those efforts include installment plans for some Apple devices, as well as bigger pushes on the iPhone 4S and iPhone 4, both of which are priced closer to the affordable range for the average Chinese consumer. Apple has seen some success with those efforts, with the iPad mini debuting to "insatiable demand" and stock-outs last year. Cook also pointed to the growing community of Chinese iOS developers as a positive indicator. "We now have about half a million developers in China working on iOS apps," Cook said. That's up over 70 percent year-over-year." Going forward, Apple won't be letting up in China any time soon. The company has plans to double the number of retail stores to 16 over the next two years, according to Cook, who ended his comments on the market in an optimistic fashion. "I continue believe," Cook said, "in the arc of time that China is a huge opportunity for Apple. I don't get discouraged over a 90-day cycle that could have economic factors."